Saudi Crown Prince Mohammed bin Salman is aggressively challenging Iranian ambitions in the Middle East. But is he up to the task? Saudi Arabia appears to be on a warpath across the Middle East. The Saudi-orchestrated resignation of Lebanese Prime Minister Saad Hariri, and Saudi officials' bellicose rhetoric after the launch of a ballistic missile targeting Riyadh from Yemen, appear to herald a new period of assertiveness against Iranian interests across the Middle East. Crown Prince Mohammed bin Salman's sudden moves on a variety of fronts may superficially have the feel of Michael Corleone's swift and simultaneous strikes at his family's enemies in the closing frames of The Godfather. Unlike in the film, however, the credits are not about to roll. Rather, these are the opening moves in an ongoing contest — and it is far from clear that the 32-year-old crown prince has found a formula to reverse Iran's advantage. Let's take a look at the track record so far. The confrontation between Saudi Arabia and Iran is taking place across a swath of the Middle East in which, over the last decade, states have partially ceased to function — Iraq and Lebanon — or collapsed completely, as in the case of Syria and Yemen. A war over the ruins has taken place in each country, with Riyadh and Tehran arrayed on opposing sides in all of them. In Lebanon, Hezbollah vanquished the Saudi-sponsored "March 14" alliance of political groups that aimed to constrain it. The events of May 2008, when Hezbollah seized west Beirut and areas around the capital, showed the helplessness of the Saudis' clients when presented with the raw force available to Iran's proxies. Hezbollah's subsequent entry into the Syrian civil war confirmed that it could not be held in check by the Lebanese political system. The establishment of a cabinet dominated by Hezbollah in December 2016, and the appointment of Hezbollah's ally, Michel Aoun, as president two months earlier, solidified Iran's grasp over the country. Riyadh's subsequent withdrawal of funding to the Lebanese armed forces, and now its push for Hariri's resignation, effectively represent the House of Saud's acknowledgement of this reality. In Syria, Iran's provision of finances, manpower, and know-how to the regime of President Bashar al-Assad has played a decisive role in preventing the regime's destruction. The Iranian mobilization of proxies helped cultivate new local militias, which gave the regime access to the manpower necessary to defeat its rivals. Meanwhile, Sunni Arab efforts to assist the rebels, in which Saudi Arabia played a large role, ended largely in chaos and the rise of Salafi groups. 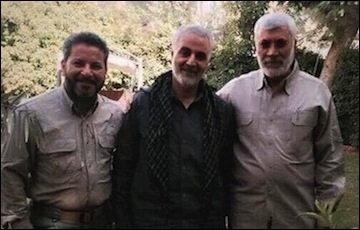 Kataeb Hezbollah commander Abu Mahdi al-­Muhandis (right) with Iranian Quds Force commander Qassem Suleimani (center) and Imam Ali Brigade leader Shebl al Zaydi (left). Iran also enjoys political preeminence in Baghdad. The ruling Islamic Dawa Party is traditionally pro-Iranian, while the Badr Organization controls the powerful interior ministry, which has allowed it to blur the boundaries between the official armed forces and its militias — thus allowing rebranded militiamen to benefit from U.S. training and equipment. 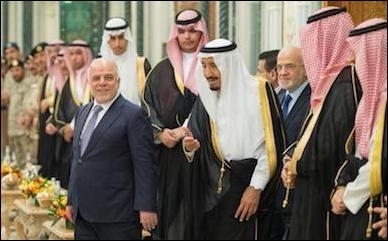 Saudi Arabia, meanwhile, has been left playing catch up: Prime Minister Haider al-Abadi visited Riyadh in late October to launch the new Saudi-Iraqi Coordination Council, the first time an Iraqi premier had made the trip in a quarter-century. But it is not clear that the Saudis have much more up their sleeve than financial inducements to potential political allies. Saudi King Salman receives Iraqi Prime Minister Haider al-Abadi in Jeddah, June 19, 2017. In each context, Iran has been able to establish proxies that give it political and military influence in the country. Tehran also has successfully identified and exploited seams in their enemy's camp. For example, Tehran acted swiftly to nullify the results of the Kurdish independence referendum in September and then to punish the Kurds for proceeding with it. The Iranians were able to use their long-standing connection to the Talabani family, and the Talabanis' rivalry with the Barzanis, to orchestrate the retreat of Talabani-aligned Peshmerga forces from Kirkuk in October — thus paving the way for the city and nearby oil reserves to be captured by its allies. The Saudis have little more than financial inducements to win potential political allies. There is precious little evidence to suggest that the Saudis have learned from their earlier failures and are now able to roll back Iranian influence in the Middle East. Saudi Arabia is no better at building up effective proxies across the Arab world, and has done nothing to enhance its military power, since Mohammed bin Salman took the reins. So far, the crown prince's actions consist of removing the veneer of multiconfessionalism from the Lebanese government, and threatening their enemies in Yemen. It's impossible to say the extent to which Washington and Jerusalem are on board with such an effort. However, the statements last week by Defense Secretary James Mattis suggesting that the United States intends to stay in eastern Syria, and by Prime Minister Benjamin Netanyahu that Israel will continue to enforce its security interests in Syria, suggest that these players may have a role to play. Rolling back the Iranians will ultimately depend on the involvement of the United States. Past Saudi behavior might encourage skepticism. Nevertheless, the Iranians here have a clearly visible Achilles' heel. 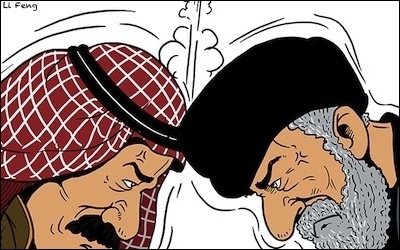 In all the countries where the Saudi-Iran rivalry has played out, Tehran has proved to have severe difficulties in developing lasting alliances outside of Shiite and other minority communities. Sunnis, and Sunni Arabs in particular, do not trust the Iranians and do not want to work with them. Elements of the Iraqi Shiite political class also have no interest of falling under the thumb of Tehran. A cunning player looking to sponsor proxies and undermine Iranian influence would find much to work with — it's just not clear that the Saudis are that player.